Titleist and I were on the same page for a sometime. We purists felt that it was bush league to adjust your driver to your swing. C’mon man – you should adjust your swing to the driver. Boy, I couldn’t be any more wrong! I learned the hard way when one of my buddies showed up on the first tee with his TaylorMade R9 adjustable driver. He had adjusted it slightly closed. His big cut fade turned into a long running draw that went by everybody in the group. Ever since then I’ve been on the bandwagon. I’m not sure what caused Titleist to hop on, but I’m guessing it had to do with all the business they were losing. It seems everywhere I look, there is a new adjustable driver coming out. And why not? For beginners, you can adjust the club closed to help prevent that slice. As you get better, simply adjust it back to neutral. For those of you worried about the left side of the golf course, adjust the driver slightly open and swing without any fear of the hooksies. The 910 D2 driver's adjustable hosel allows you to change the drivers loft and lie to any 16 settings. This isn't much when you compare it to the variety you get from TaylorMade's 48 on the TaylorMade R11 or the 32 positions you get from the Nike Victory Red STR8-Fit Tour Driver. That being said, I haven’t run into too many situations where I needed 48 different face settings. I suppose the more you have the more flexible you can be, but I’m thinking 16 is plenty. Nevertheless, leave it to Titleist to be conservative in their design. After all, like I said it's more about finding your individual settings then having a plethora of face angles. And at least Titleist is coming around. They were slow to get on the band wagon but you better believe the product they put out is going to be good. The one thing I can say bad about Titleist drivers in general is the faces don’t seem to be as hot as most of the other brands. Perhaps this is because they are building them with workability in mind, rather than distance. That being said, many club makers like Callaway, Nike, and Taylormade have plenty of drivers that accomplish both. 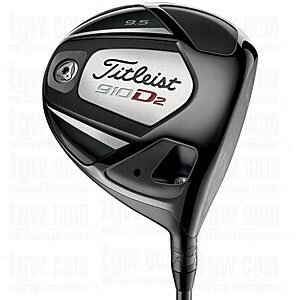 I'm going to recommend this driver for lower handicappers, staying on par with most of the Titleist clubs I review. You good players are really going to like the alignment aid and using it to work the ball to your liking. However, the club is a heavy 320 grams compared to many of the premier drivers from the other market leaders (e.g. Cleveland's XL 270 weighing in at 270 grams.) Perhaps they'll jump on that bandwagon next year.